What are agricultural pesticides? Agricultural pesticides are used in many different applications – heavily used for protecting crops, controlling weeds, insects, fungi or altering the life cycle of harmful pests. Agricultural pesticides are widely used to control threats to agricultural production that can impact food supply. Contain pesticides and related products in a pesticide storage unit, for maximum safety. Heavy-gauge steel pesticide storage units by US Chemical Storage offer a safe, secure and protected environment, inside and out, for maintaining pesticides compliantly. Do not store pesticides with animal feed, food, seed, or other products that can become contaminated. Store incompatible materials in separate rooms segregated with a solid partition wall. Ensure pesticide containers are tightly sealed. Properly date pesticide containers before they are placed into the pesticide storage unit. Do not stockpile pesticides – keep storage limited to only one season. Keep track of pesticides to eliminate outdated inventory. Implement proper accessories in your pesticide storage unit for safety and security. Utilize mechanical or natural ventilation for consistent air-flow. Follow directions on pesticide storage labels to ensure the safety of personnel and the environment. Do not store pesticides near an ignitable source; including direct sunlight or heat. Pesticides may be volatile to combustion. Use proper temperature controls (cooling or heating units) when storing pesticides (depending on geographical location). Keep your pesticide storage unit free from combustibles. Maintain inventory monthly or annually (check with local authorities for maintenance requirements). While this document may cover a number of important compliant pesticide storage regulations, it does not address every situation for maintaining pesticide storage. Pesticide storage can vary by state, therefore contacting your state’s Department of Agriculture about proper storage techniques is advised. Manufactured from heavy-gauge steel and designed by professional engineers to keep your pesticide storage safe, secure and protected. 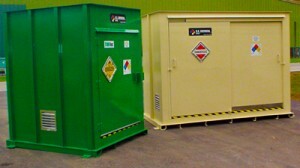 Pesticide storage units by US Chemical Storage are 100% customizable to meet your exact specifications. These units come with a 15-year structural warranty and a built-in secondary sump containment to keep your pesticide storage fully contained. Customize your pesticide storage unit with a wide variety of accessories including explosion proof and non-explosion proof options. Meets EPA, OSHA, NFPA regulations and FM or Warnock Hersey approvals.